Hi! My name is Carole and I have a special needs adult son, Domenic. Recently, my son was gifted a 55 gallon fish aquarium. I went over to your store which is in front of where my son and other handicap gentlemen reside in a home on Roberts Lane. The first employee I encountered was Aaron, in the fish department. His knowledge was endless. He did not hesitate to provide guidance and help. I explained how this aquarium is for the group home located right behind the plaza on Roberts Lane and that my special needs adult son, (he is 34 yrs old) lives there with other handicap men. I explained that my son would probably walk over periodically to the store to purchase supplies, fish and items for this tank. I explain how he is a little slow mentally and things might have to be repeated. Aaron was more than willing to guide him. He also mentioned that he would tell Darlene, another employee in the fish dept, so she could assist him with fish stuff. My son did go over on the weekend and met Aaron. Dom called me later that night and told me how "Aaron really knows fish," "told me my water was good," "helped me pick out some fish," etc. Aaron has actually taken the time to educate Dom when he goes over for supplies or to buy fish. Aaron is a tremendous asset to your company!! Most people disregard the handicap or special needs and don't make time for them. Aaron and the rest of the staff: Darlene, Chad, Gabby....they all treat Dom and the other special needs guys with respect. Your staff takes the time to make each visit special and a learning process. My son and the other guys LOVE the tank and LOVE watching the fish and feeding them. 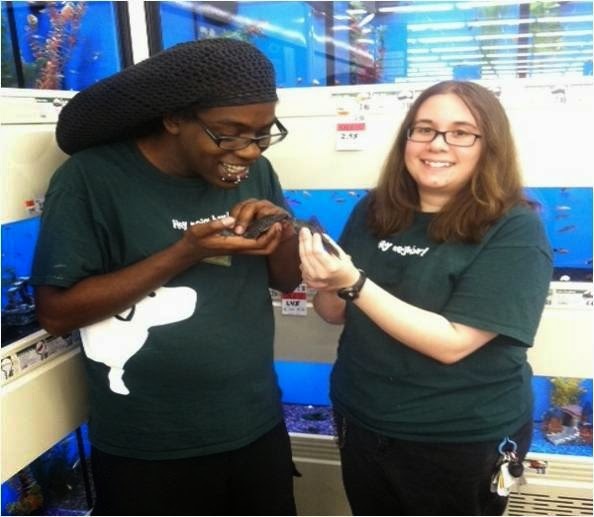 When he gets his very small paycheck from the little bit of work he does, he goes over to get a new fish at your store. Of course, he consults Aaron, the "Fish Guru", as he looks up to him! What Aaron says to do is RIGHT! It's great! So Dom is still purchasing fish a little at a time and watching the fliers for what is on sale. ALL the staff keep him abreast of the sales to help him out because doesn't see real well to read the fliers. Aaron, Chad, Gabby, Darlene have definitely made an impact. They should be commended on their professionalism and taking the time with every customer regardless of their abilities. You should be very proud of this exemplary store. What fabulous neighborly service! 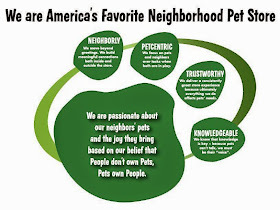 Aaron, not only were you knowledgeable about our product, but you went above and beyond to ensure that these neighbors had the special assistance they needed to have a great PSP experience and an enriching adventure with their pets. This is exemplary paw-print behavior and worthy of a Lexi award! Exellent staff & great teamwork, way to go!! 2 Paws up! !